Rep. Cynthia Browning (D-Arlington) speaks for amending an energy bill on the House floor Tuesday. 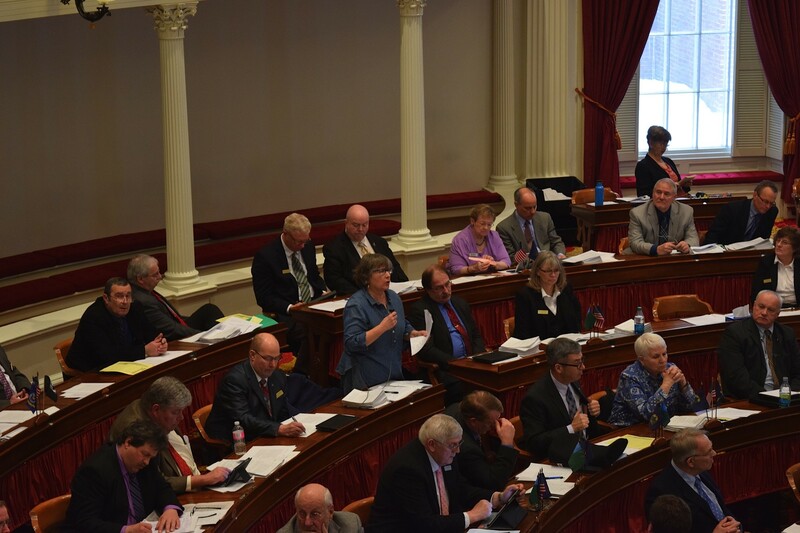 House Democrats shrugged off efforts Tuesday to rein in a renewable energy bill that supporters say will boost the use of renewable energy, increase energy efficiency and save Vermonters money. By a 122 to 24 vote, the House sent the bill to the Senate, but not without questions from those who say the bill would end up costing electric customers more, not less. "They're saying it's going to bring lower rates and we just don't believe that," said House Minority Leader Don Turner (R-Milton), who tried stripping the bill of provisions that would require utilities to offer incentives for customers to reduce their use of fossil fuels. His amendment was defeated 99 to 42 on the House floor. The overall bill, H.40, establishes new standards for renewable energy in Vermont, requiring that by 2032, 75 percent of electricity sold in the state come from such sources as wind, solar and biomass. Much of the bill found broad support, because it would avert an estimated 6 percent increase in electric rates expected as Vermont utilities struggle to sell renewable energy credits to neighbors with different standards. What's more controversial is a portion of the bill that would make utilities offer incentives to customers to reduce their use of oil and gas by using cold-climate heat pumps, better insulation and plug-in vehicles. Supporters, including officials at the Department of Public Service, say that provision would save $275 million, reduce carbon emissions by 15 million metric tons and create 1,000 jobs by 2032. "Without hyperbole, this legislation would be good for the economy and the environment," Darren Springer, deputy Public Service commissioner, told legislators in a memo on the bill. There are valid reasons to doubt those numbers, according to Tom Kavet, the legislature's contracted economist. He told lawmakers in a memo last month that the savings estimates are based on uncertain assumptions about oil prices and the value of energy-efficiency efforts. "The full economic impacts of the program have yet to be modeled – and could produce further downstream fiscal impacts, both positive and negative," he said. Turner also argued the effort duplicates the state's existing programs, which help Vermonters make their homes more energy efficient, including Efficiency Vermont. "How many houses are left, Tony?," Turner asked committee Chair Tony Klein (D-East Montpelier). "There's only so many houses in Vermont." Plenty are left, Klein and other committee members said. The state's goal was to increase energy efficiency in 80,000 Vermont homes by 2020, but the state is on track for 40,000 by 2020, said committee Vice Chair Rebecca Ellis (D-Waterbury). "The barriers that this committee has heard year after year after year is that not low-income Vermonters, but average-income Vermonters do not have access to affordable financing and an easy entry point to get help into weatherizing their structures, so we saw this as an opportunity," Klein said. Rep. Cynthia Browning (D-Arlington) was also dubious of portions of the bill. She tried to offer changes to limit the bill's risks to electric ratepayers and to communities worried about the siting of renewable energy projects. Both efforts were defeated on the House floor. "I want to make sure that ratepayers' interests are protected," Browning said of one amendment that would prevent electric utilities from including the costs of energy-efficiency efforts in the rates that customers pay. Browning also tried to address concerns that increased requirements for renewable energy will leave more communities feeling they lack a say in the siting of projects. Her second amendment sought to address concerns from communities where local residents felt their opinions didn't count when it came to siting large energy projects such as wind turbines. She wanted to require the Public Service Board to take neighbors and local policies into account when approving siting. Klein argued that the board already does that. Browning's amendment failed, 90 to 53.